NEW DELHI: Indian fast bowler Mohammad Shami has been blamed to have extra-marital affairs with multiple women in and outside the country. 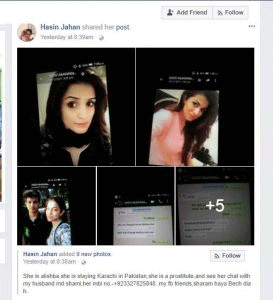 Shami’s wife, Hasin Jahan made these revelations in a Facebook post. Jahan also blamed Shami for physically abusing and torturing her. Hasin on Wednesday, filed a complaint with the Kolkata Police, accusing her husband of having multiple extra-marital affairs and physically assaulting and threatening her over a period of almost two years. “Shami is neither concerned about me nor our baby. He tortured me physically and mentally over and over again. He asked me to accept what he was doing and threatened me with dire consequences if I ever broke my silence. “I somehow managed to access the security code on his phone and saw the chats last night. It was almost 11 PM. I was shocked and could not sleep,” said Jahan. She alleged that Shami assaulted her after returning from the South Africa tour. “The dirty chats that I have posted on my Facebook wall is practically nothing in comparison to what Shami had done with these women,” she alleged. 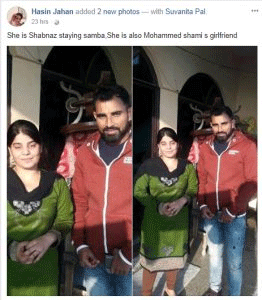 Shami denied the allegations in a Facebook post. “What is being said about my personal life is completely false. It’s definitely a part of a big conspiracy against me. This is just an attempt to defame me,” said his post. Shami was not available to comment when contacted.